Can we all get together and do it again? Who’s in? The second Make48 went off without a hitch! We were wowed by the ideas teams came up with, not to mention how they executed and pitched them. Now, without further ado, a little recap. The product category? Now that we can finally tell you… was BBQ!! Can you blame us? The American Royal was in town! In fact, we bussed teams out to visit the Royal on Friday evening for a little market research. Major thanks to Operation BBQ Relief, the not-for-profit corporation that invited us into their massive party with open arms. If you love BBQ, this is an organization you need to know about. In May 2011, competition barbecue teams from eight states drove to Joplin, Missouri to help feed displaced families and emergency personnel in the aftermath of the second deadliest tornado in U.S. history. Operation BBQ Relief was born, and the rest is history. So, what were the challenges we posed to our 21 teams? We’re proud to say they came directly from the major BBQ producers who partnered with us. Our partners sell their goods all over the world; together, they have more than 200 years of experience in this category. 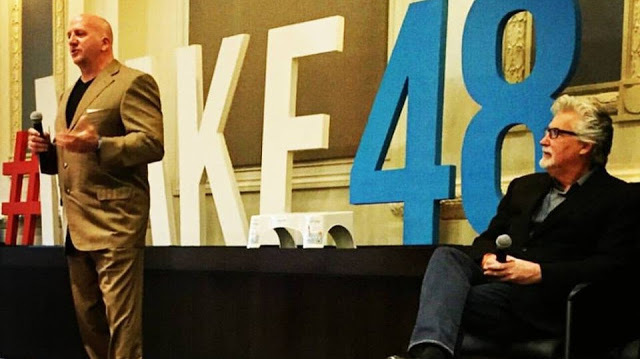 Make48 is more than a competition. We want to see ideas developed at our competitions on store shelves. Because we know it’s possible. Charcoal and wood create ash. Come up with a solution for managing it more efficiently. Barbecue requires transferring food to the smoker, getting it in, and then away. Develop an innovation that aids in this process. Putting together a new barbecue grill or smoker requires assembly time. Design a product that reduces assembly time and/or the amount of tools required. Remember, compact packaging is important. Design a better pancake dispenser (larger volumes of batter, better dispensing control, eliminates the need for dishes and utensils to mix the batter). We’d like to point out that each team had at least two members who were under the age of 18. Wow! We’ve been told young people are more readily able to tap into their creative muscle — the second Make48 certainly bore that out. In fact, the winning team was composed of three students from Lee’s Summit North High School and their mentor, a mechanical engineer. The second place team was composed of three students from the Kansas City area who participate in the Youth Entrepreneurs program, and their mentor. The third place team was composed of a father and son and father and daughter from Kansas. Make48, it would seem, is for everyone. 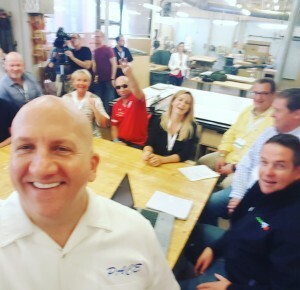 Hours after the competition wrapped up, Make48 Founder Tom Gray presented the winning product ideas to our partner open innovation companies. The companies have 60 days to make an offer before the teams are invited to shop their ideas around elsewhere. In addition to the possibility of their idea being licensed, each team received a cash reward. In the event that the companies pass, we’ll help them bring their products to market via crowdfunding.